On June 18 I left the heat of Alabama Hills (107 high / 80 low) to start up the North Fork Trail towards Mt. Whitney. My goal was to climb the 1,000 ft East Buttress of Mt. 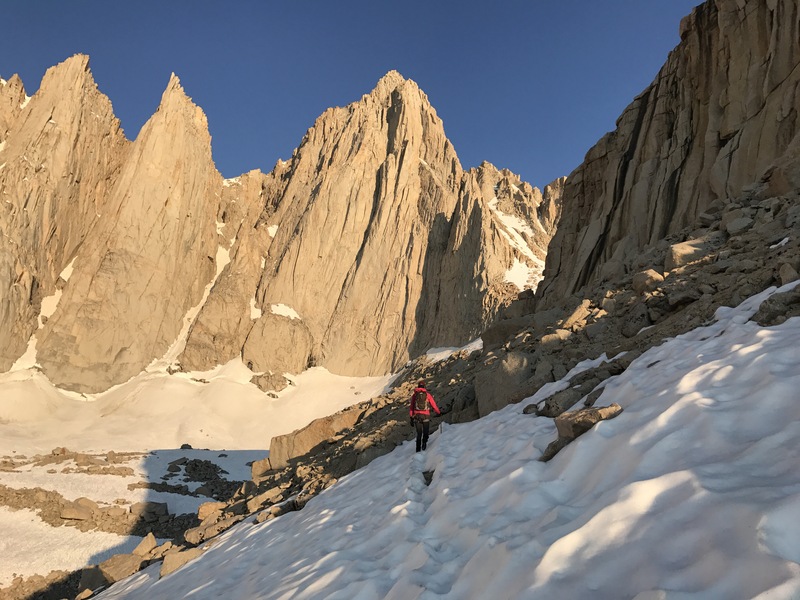 Whitney on an 11 pitch 5.7 route after an approach of 5 miles and 4500 ft elevation gain. Route finding was the major challenge of the climb. Making it more like 5.? given all the potential variations. On the first day, it took us 8.5 hours to lug our 55 lbs packs up to high camp at 12,000 ft just below Iceberg Lake. Even early in the morning, the rivers were high. For the most part, there was a trail to follow for the approach, but it gets bush-whacky around water. 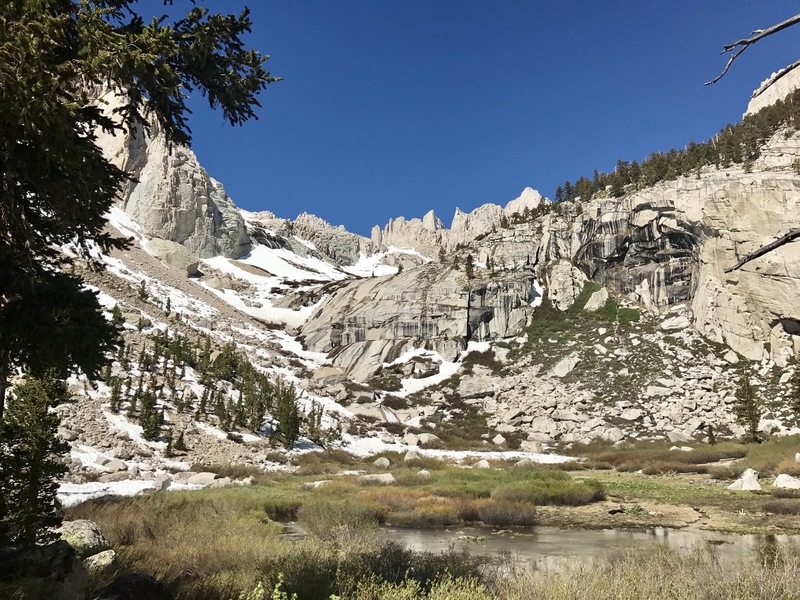 Snow travel started above Lower Boy Scout Lake, but the snow line changes daily with the intense heat. 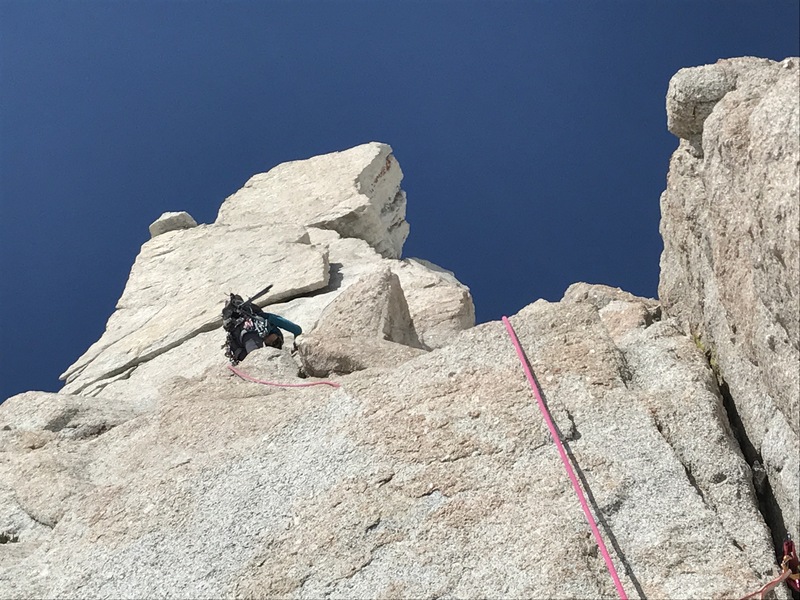 I started getting the headache and nausea from altitude, sun and heat around 11,500 ft (a gain of 8,000 ft from Alabama Hills). So we set up camp on a granite boulder surrounded by snow just below Iceberg Lake at 12,000 ft and I passed out. On the day of the climb we hit trail at 5:45am and reached the base of the climb above Iceberg Lake at 8:30am. The snow, even at 6am, was soft so we didn’t bring our crampons. At 8:30am we started the climb and soon realized the true crux of the route was finding it and keeping the climbing difficulty down. 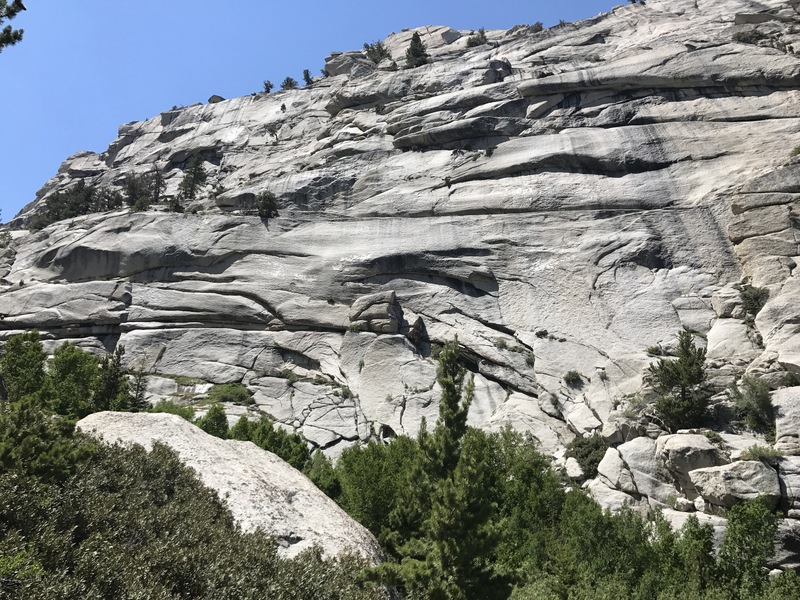 Even following the topo I would be in terrain that felt much harder than 5.6 and the climb becomes more like consistent 5.7 than 5.6 or below. Even the 5.6 was harder than I expected. Every flake I tapped was hollow and 1/3 of the blocks I touched were loose. On a normal climb a hollow sound meant not to use that hold, but on the East Buttress, it meant just don’t pull too hard. All day in on my mind were the dozen accident reports of people falling to their deaths, broken limbs and cut ropes from watermelon to refrigerator size blocks pulling loose (most of these in the Sierra) over the last two years. The exposed and harder grade, extended route finding and probably the altitude slowed us down a lot. My partner was having a particularly hard time with the climb and I knew we were in trouble when we reached the top of P4 at 1pm. At this point, I took all leads and moved as quickly as I could. Going without water for the next five hours. On the last pitch we heard (and then saw) an isolated thunderstorm South of us that started to sprinkle graupel. 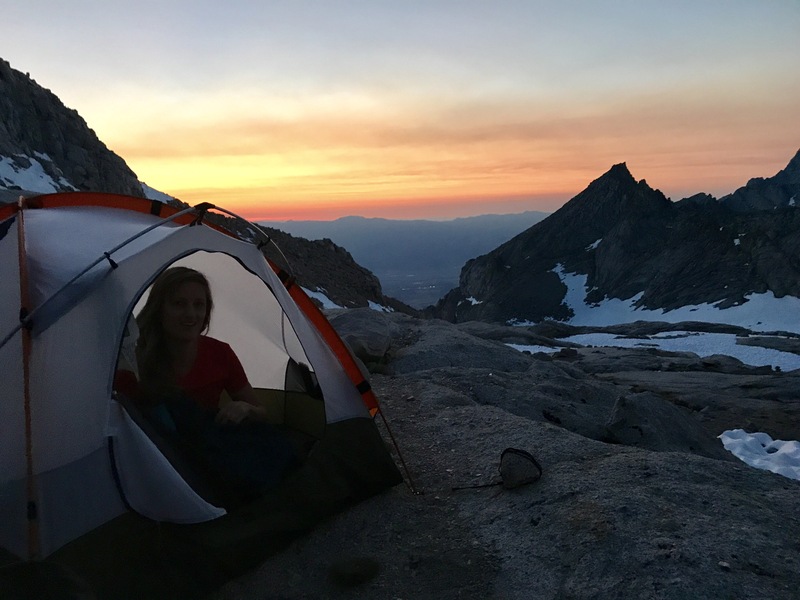 I figured lighting storms in the fair-weather Sierras were a myth, but it became too real when Sadie started getting static discharges on her skin from the ice axes on her pack. A glorious sunset on the summit also reminded us it was 8pm. Worried about getting struck my lightning and finding our way back in the dark. Unable to find any snow footprints we quickly committed to the first of three snow gullies we found. Later we traversed to the second gulley since its snow extended further down rather than risk getting cliffed-out. 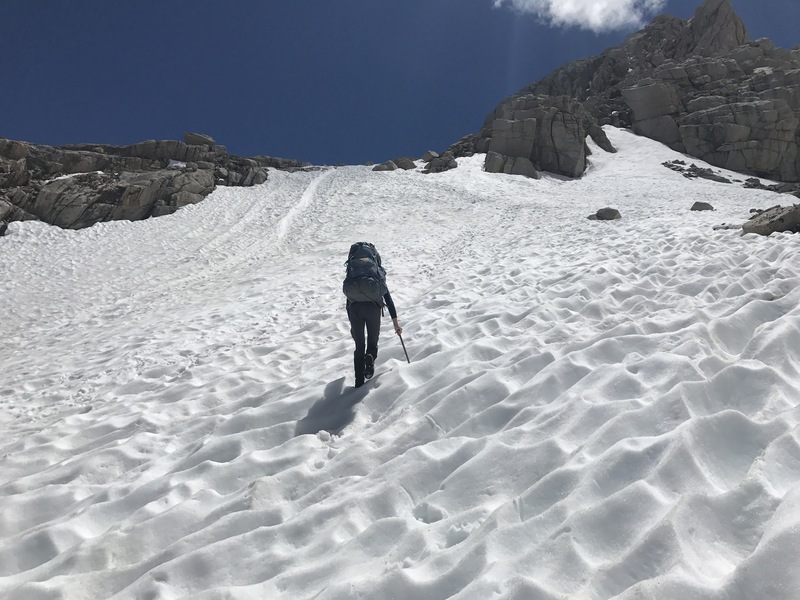 The grade of the snow was steep (~40 degrees) and luckily not icy since we didn’t have crampons. However, it was so soft that if you fell you wouldn’t be able to self-arrest. So we kicked stepped down with the axe in self-belay. Eventually, we descended on top of the mountaineer’s route. 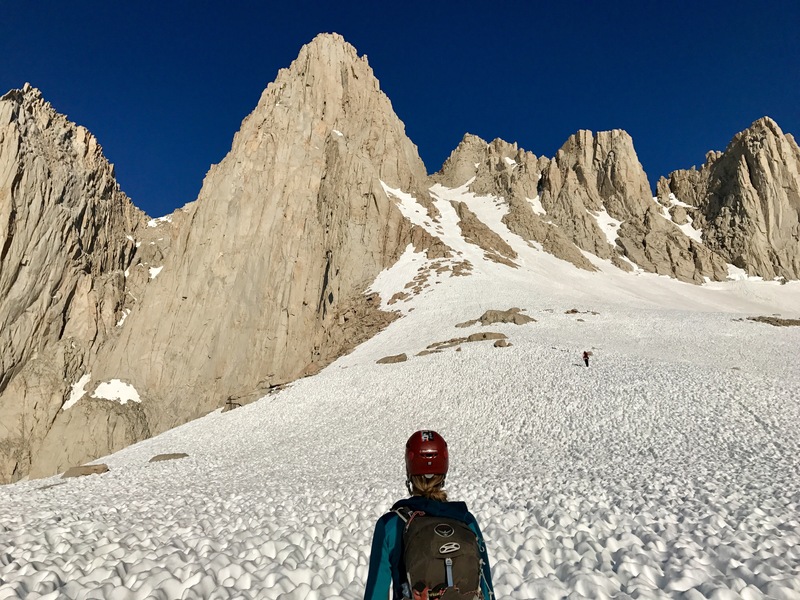 Following the trail, we traversed across the snow, over a rocky outcropping and finally down into the front mountaineer’s gully which ran parallel to the East Buttress. Now dark, we used our headlamps to reach the ice crusted snow line. It was extremely strenuous to control the speed on the 2000 ft of near out-of-control ice glissade by headlamp. My consciousness was a fog the final mile trudge back to high camp through icy sun cups. We arrived back to our tent at 10:30pm exhausted. I had only eaten half a bag of trail mix and drank 1.5 L of water over the entire 17 hour day. The next morning we had a mostly uneventful six-hour descent. 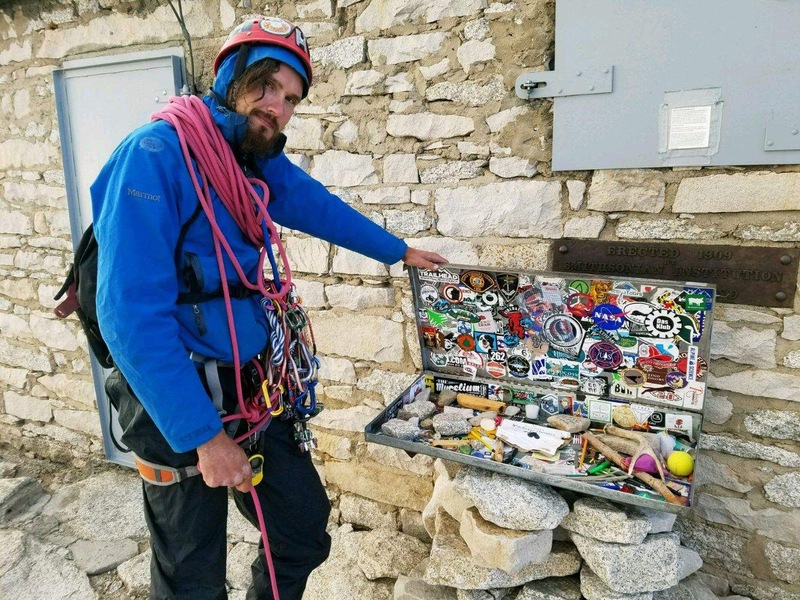 We got off route on the Ebersbaucher Ledges, missing the correct switch back due to a poorly placed cairn which I destroyed with a purposeful kick. We crossed the rivers midday at their highest. All rocks were covered with rushing water and part of the trail become a stream. We brought a single rack + doubles in red / green cams + 1 set of nuts. It felt right. Bring as many double length slings as you can find. The rope was like pulling a sandbag due to friction on P5. Route is dry and mostly free of snow. 3rd class section on P9 filled with snow. Iceberg Lake is unsafe to collect water from as it has thin ice and its boundaries are unclear. We boiled snow. Rivers are very high due to snow melt. Descend early and be prepared for boot high water running over rocks. 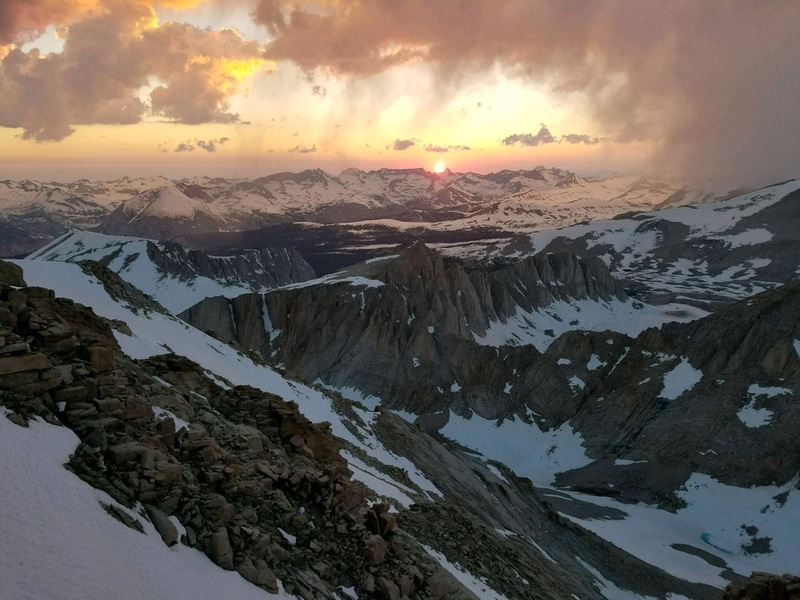 Snow is mostly sun cups and starts at 10,500 ft. It ether has an ice layer or is snow cone consistency. We didn’t use crampons. It was very warm (107 degrees at 3,700 ft), but the route can get cool. We were comfortable sleeping in base layer + 20-degree bag + tent without rain fly.